I must say this newborn session was one for the books! This little guy was a bundle of joy to have at Neal Urban Studio. Dad owned all these model vintage cars. They wanted to incorporate them somehow into the shoot. What better way, then to have the baby sleep on the roof of one! 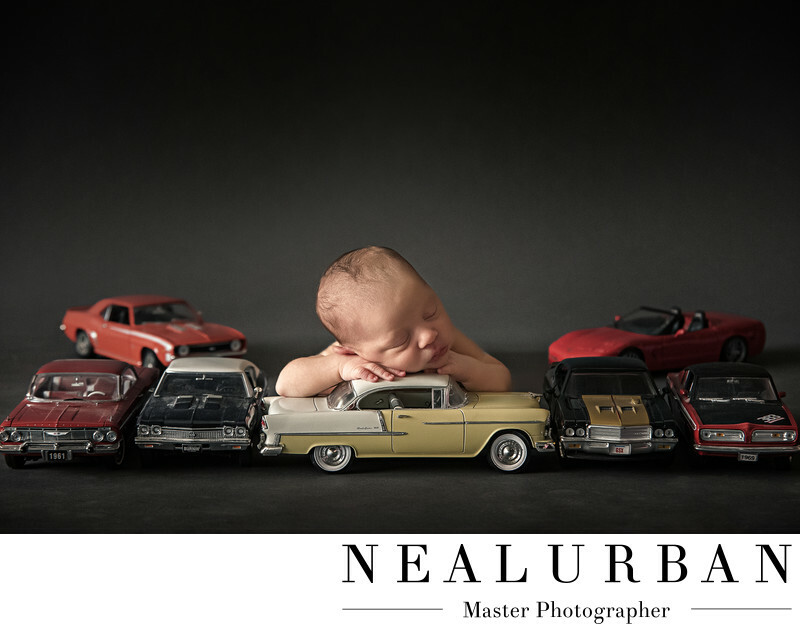 I know this image looks like it was as simple as the newborn is sleeping right on the car. Well, it was! I have no idea how it happened either. We placed all the cars where we wanted them to be. All on a plain gray back drop. Usually for a pose like this you need to do it in multiple shots and merge them together in post. This baby actually fell asleep and stayed that way when we slowly lowered him into the scene. We were holding his head up for comfort, when we realized that he was out like a light. We gently rested his hands on the car and his head on his hands. He stayed there! This was such a huge shock and bonus. There would be no merging of photos for this idea! For newborns, everyone has to be super quiet and the studio needs to be super hot to keep the baby sleeping. Babies are so unpredictable too. We have had times where the baby was awake the entire photo shoot. That is something we cannot control. Mom can feed the baby and try to get the baby what they call milk drunk! That means the baby is full and hunger is satisfied, at least for an hour! But, that does not always work. In this case, this little guy was just interested in sleeping and nothing else! We got to do so many different ideas with this newborn! We always keep one main idea in mind though, in case we do not have the best luck with a not so sleepy baby! Location: 2495 Main Street Buffalo, NY 14214.